On August 30 a statue of St. Josemaria Escriva was placed just outside St. Peter’s Basilica in Rome. 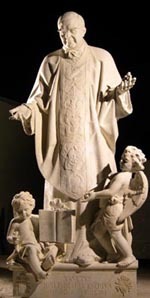 The statue is located in an exterior niche of the Basilica alongside other sculptures of the same dimension: St. Teresa of the Andes, St. Marcelino Champagnat, St. Gregory of Armenia, etc. John Paul II intended that the niches in this area of the Basilica be occupied by saints and founders of our time. In 2002 the same Italian artist, Romano Cosci, sculpted a figure of St. Josefa of the Heart of Jesus, foundress of the Handmaids of Jesus, which has also been placed in the Vatican.